Mike Boland's campaign office is on 15th Avenue in East Moline, down where Tony's Key and Hobby was once located. The office has been very active lately, full of volunteers, and people stopping for yard signs and more information about Boland's campaign. The campaign office can be reached by calling 309/755-6769. 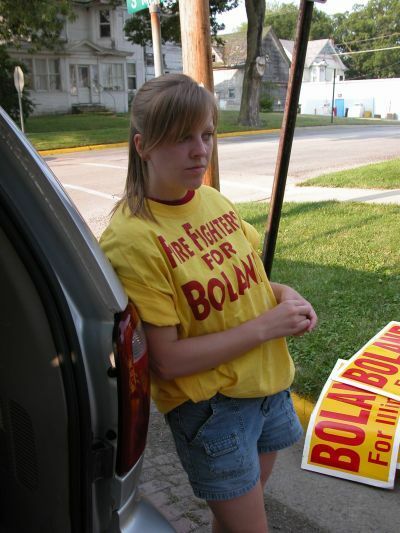 Pictured is one of our campaign workers, Anne. Anne is a great young lady with a bright future ahead of her. She and the rest of the campaign staff have really been working their tails off for Boland, and I hope they know how much I appreciate their efforts on Mike's behalf! I'm getting too old and infirm for 18 hour days like these folks have been working, being staff for a campaign really is a young person's game for a reason! I hope they know I am with them in spirit, even when I can't quite get my body to cooperate.